Over the past several weeks, we talked to a lot of young people who are organizing and/or participating in community projects that specifically use the arts to stimulate environmental education and awareness. Our team of nine youth researches for the Recrear-CYEN participatory project all agreed that the use of art mediums encourage problem solving and critical reflection among youth. With regards to the environment, it is an effective way to attract them to think about, develop or deepen their relationship with nature. According to them, we are less likely to pay attention to or look after those things that we do not know or understand. That being said, from a young age Cuban youth are introduced to music, dance and the arts. At the very minimum, every municipality also has a Cultural House (Casa de Cultura) which acts as a community space where children and youth can come to receive music, dance and singing lessons for free. In this backdrop, our researchers have shown excitement about the potential of bridging environmental education with these strong cultural norms that encourage artistic self-expression and art as a tool that fosters community. They stress the importance of having relaxed spaces where youth can move around autonomously and communicate or perform their experiences, struggles and dreams with each other through music, dance, theatre, drawing, poetry, etc. Marisol and Maria Silvia – These two sisters are working with the environmental organization Antonio Jimenez Perez in Havana to socialize and integrate other young people with permaculture work in Cuba. Their strategy has been to attract young neighbors through dance, music, theatre and poetry performances, which they organize at their permaculture farm. Roydes and Liliet – Four years ago, these two started Amigos de la Planeta, an environmental awareness raising project for young children ages 5 and up in the Guanamacóa municipality of Havana. Jessica and Dalenía, another pair of our Havana workshop participants are also the founders of the Amigos de la Planeta. They organize art clubs and workshops for kids, either at elementary schools or in community spaces. The idea is to inspire kids about the importance of appreciating and taking care of the environment through whatever platform of artistic expression best appeals to them – it could be photography, theatre, video, poetry, creative writing, etc. The result is a fun, meaningful experience that the kids are also more likely to remember, replicate and share with others. Oyantai and Johnny – are two DJs from Havana who became close friends six years ago when they first joined the Madriguera centre in Havana. The Madriguera is a relaxed space to connect Havana youth interested in different art forms of arts and support each other through art. 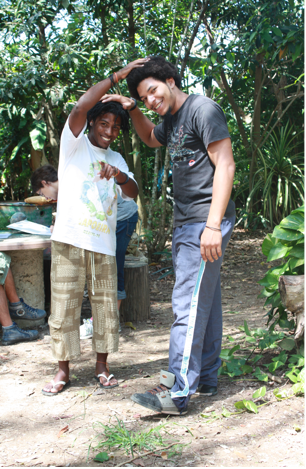 Oyantai and Johnny are involved with the so called “music lab” at the Madriguera. The Madriguera is very popular with Havana youth and it has attracted environmental artists who put on concerts and workshops, photography and poetry contests, art exhibitions, and urban ecological projects. The DJs themselves are often the ones providing the music at these events. They feel that these performances have been a space for young people like them to explore their identities and express their own visions for sustainable future based on environmental commitment and responsibility.